This is a hearty stew inspired by some similar Russian stews I’ve come across over the years. I imagine it to be something eaten in Siberia, or on Wrangel Island, where many of California’s snow geese spend their summers. I used snow geese in this recipe, but the dish would work with all sorts of meats: other geese, ducks, jackrabbit or hare, muskrats, venison — and yes, domestic beef or lamb. I also used wild yellowfoot mushrooms, which can be hard to find. If you have access to a fancy supermarket, buy them, or buy beech mushrooms. If that’s not an option, any fresh mushroom will do. Don’t have celery root? Use potatoes. No barley? Rye or wheat berries would also work, although rye takes a long time to cook. No duck fat? Use lard or butter. No duck stock? Use beef stock. This stew keeps well in the fridge for a week, and it freezes well. Heat the duck fat in a large Dutch oven over medium-high heat and brown the goose legs well. Salt them as they cook. Remove the goose legs as they brown and set aside. Once the goose legs are all browned, add the onions and mushrooms and turn the heat to high. Stir to combine. Saute until the onion begins to brown, about 6-8 minutes. Add the marjoram and return the goose legs to the pot, then pour over the duck stock. Bring to a simmer and cook until the goose legs are tender, anywhere from 1 hour to 3 hours. When the goose legs are tender, remove them, let them cool a bit, and pull all the meat off the bone. Return it to the pot. Add the barley, carrots and celery root. Stir well and cook until the barley and celery root are cooked, about 30 minutes. Add salt to taste. Serve garnished with dill and black pepper, and give everyone a dollop of sour cream on their bowls when you come to the table. Snow geese are fast learners and quickly become wary when hunted. They are long-lived and travel in large flocks, so thousands of experienced eyes examine every potential feeding and resting place for danger before landing. Furthermore, their nomadic lifestyle makes them difficult to locate. Hunting snow geese requires hard work and specialized strategies, but those who learn the tricks find it immensely rewarding. Several hunters claim that few outdoor experiences can compare with being at the center of a swirling-vortex of several thousand squawking snow geese settling into a decoy spread. Follow these quick tips to improve your odds on your next trip. Begin by driving back roads to locate fields where snow geese are feeding. Scouting the fields for where the geese want to be is the key to success. Find the landowner and always get permission to hunt before anything else. If the decoys can be set by mid-afternoon, you can hunt the field that evening and again the next morning. Snow geese usually return to a field until the food is exhausted. However, they have good memories and will not return to a place where they have been shot at. Finding a hot field and setting out decoys may result in two or three successful hunts; an evening, morning and possibly another evening. After that, the birds are gone and its back to scouting. Hide all signs of human activity, including tire tracks, candy wrappers and any other non-natural items. Park vehicles at least a half mile away. Set out a minimum of 300-500 full body decoys (800 to 1,200 is better). Using Silosocks and shells to fill in. Supplement full body decoys(Avery, GHG, Bigfoot) with lighter, less expensive shell and silhouette decoys. Wear camouflage or white if snow covers the ground. 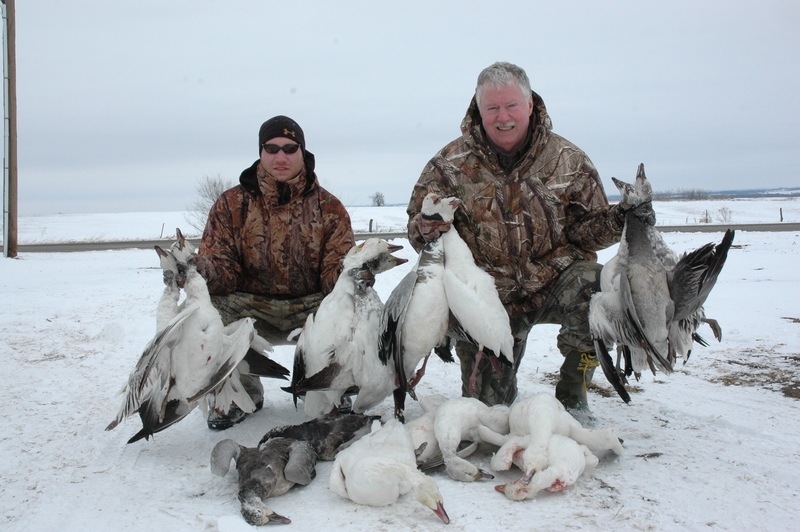 Electronic calls will work on large bunches of snow geese while often time a mouth call can be for calling in single birds or isolated pairs. Do not begin shooting until your outfitter or guide calls the shot. For maximum shooting opportunity, wait until bird are in front of the blinds and everyone is ready. The snow geese may circle many times before they are in gun range. Snow geese are also know for leaving a decoy spread for NO reason at all. Hunting partners should agree on fields of fire so shooting opportunities are not wasted by shooting at the same bird. Take your first shots at birds that are at the fringe of your effective range, then work your way back through closer birds. Focus on one bird at a time. A morning’s shooting ends when the birds go back to roost in refuge areas during the middle of the day. Sometimes that is as early as 9 a.m., other times they may not roost until noon. Afternoon feeding flights can arrive two hours before dark, but they may not appear until shooting hours are almost over. 3-inch shotgun shells with BB or BBB steel shot work well for snow geese but many of the performance loads like Hevi-shot, Hevi-Steel, Bismuth are excellent choices. Call 855-473-2875 To Book Your Hunt!